And, just like that, all your advanced threat protection, anti-virus, and anti-malware protection and the bad guys are still getting to you. There is a new phishing scam going on these days that use legitimate resources to pull off classic social engineering maneuvers to capture your information. 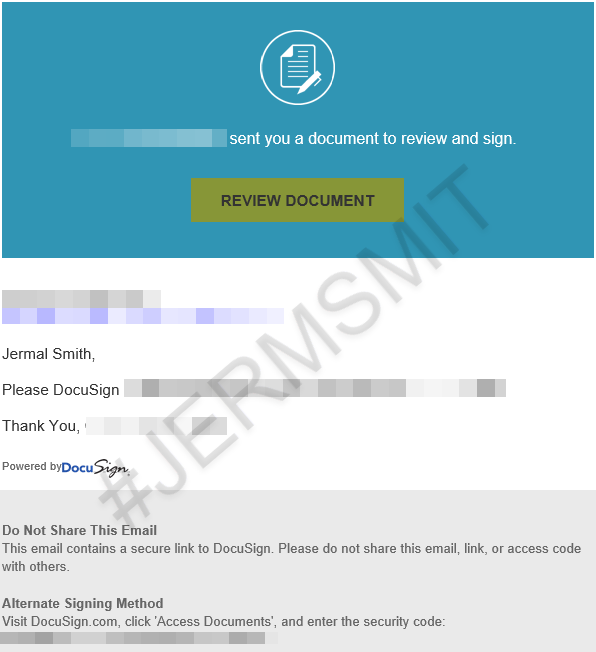 Enter – DocuPhish – The bad guys are now using the Docusign infrastructure to launch attacks against unsuspecting victoms. By clicking on the yellow “Review Document” button you land on a legit Docusign page, where are asked to fill out the form with information about yourself, your company. Filling out such a form would allow for the phisher to steal your or companies identity.